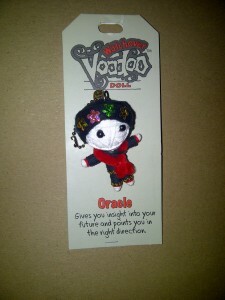 A client and his wife bought me this voodoo doll while they were on vacation (see picture). I thought voodoo dolls were for sticking pins into and putting curses on enemies. Let’s look on the bright side and assume for the sake of argument that the doll is well-intentioned. So, assuming the garnered insight is about Oracle databases, how does the doll point us “in the right direction?” Can it access my clients’ databases? Does the insight get delivered to me, the database consultant, or directly to my clients? How is the insight delivered – email, Twitter, telephone call? And, when it opines, “If you don’t change to a more acceptable CURSOR_SHARING setting, you’re going to run that database right into the ground,” would anyone believe a voodoo doll anyway? Does it get angry if we don’t heed its advice? What does a voodoo doll do when it gets angry? Hmmm … just in case, I think I’ll keep the sewing pins a safe distance away!